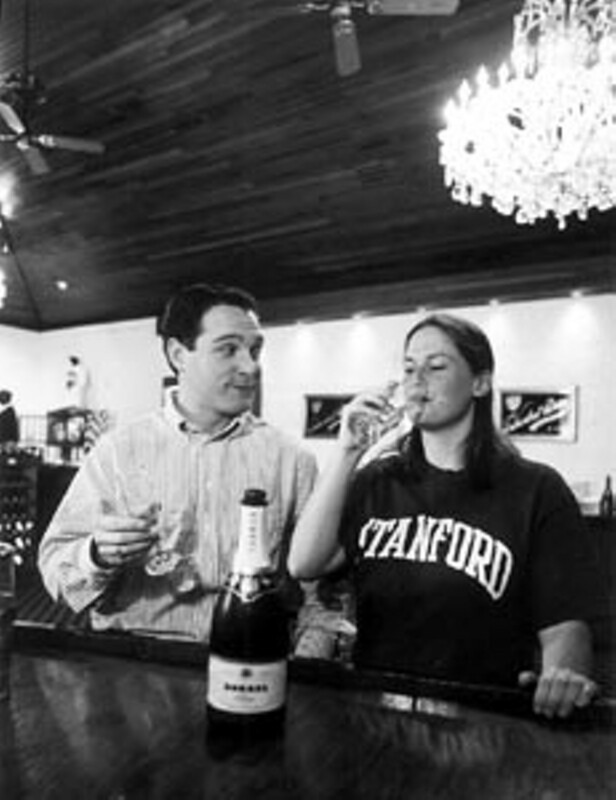 Bit o' the bubbly: Disguised in a wig, Stanford student Chelsea Clinton and an unnamed secret service buddy enjoy the spirits at Korbel. April fool! It's Hillary. SO YOU'RE CHUGGING ALONG River Road admiring the vineyards and the scenery when you come around a corner, and whoa--there's Versailles, smack-dab in the Russian River valley! Mon dieu, on second glance, perhaps this is just the Korbel Champagne Cellars (poke around the back and you'll find a brewery tucked in there as well), our readers' choice for best tasting room. And your taste is good: The gardens are massed with color and diversity; the building is a stone wonder; the valley views are magnificent; the tasting-room walls are richly paneled; the pourers are impeccably trained; and there's all that bubbly-- and award-winning chardonnay. Tour the premises, see how the sparkling and other wines are made, try some of the microbrews, pick up a treat from the gourmet deli, and toddle off to help shovel out the mud slides in Rio Nido with a renewed spirit. 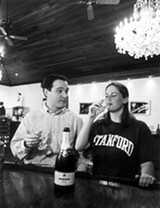 Korbel Champagne Cellars, 13250 River Road, Guerneville; 887-2294.